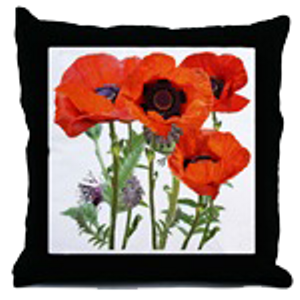 With 30 years' experience in the ceramic supplies industry, based in Stoke-on-Trent, Eileen Hallam represents several manufacturers of ceramic colours and ceramic decals (both digital and screenprinted, organic and non-organic, and also reel-to-reel decals) in Stoke-on-Trent, as well as in the Far East. Also, digital ceramic printers, ceramic toner and ceramic decal paper. 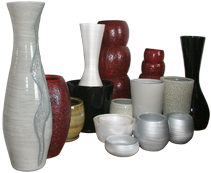 If you are looking for decoration materials for the ceramic industry, you have come to the right site. Decorating machinery is also available, and she can also help you to source kilns, refractories, etc. Call her or e-mail her to discuss your requirements! Unless otherwise stated, the products on this site can be despatched almost anywhere in the world. 1. Finished mugs, plates, etc with your artwork, including 1-offs. 2. Digital ceramic decals (no halo round the image) for you to decorate your ware yourself, now including high-temperature inglaze decals, (particularly good for hotelware). 3. 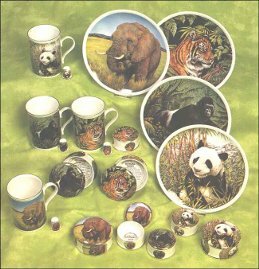 Digital ceramic printers (no halo round the image) for you to print your own ceramic decals and decorate your ware yourself, now including high-temperature inglaze decals (particularly good for hotelware). 4. White bone china / white ware for you to decorate with your own decals or handpainting, etc. 5. Ceramic kilns for you to fire your decorated ware. Eileen Hallam represents 4 manufacturers of UK-made whiteware (white bone china), ready to decorate - thimbles, mugs, trinket dishes, etc, and an importer of white bone china mugs from China. **New for 2016** - dog and cat bowls. For more information, please contact us. In some markets, she also offers cadmium pigment suitable as red, yellow or orange colouring oxides for colouring vitreous enamel, eg for red saucepans. A range of other colours is also available. For more information, please contact us. She also advises on and sells equipment and machinery used in the decoration of ceramics - kilns, digital printers, decal-application equipment, etc. For more information, please contact us. Eileen now represents a Portuguese manufacturer with a large range of beautiful terracotta planters at excellent prices, lovingly made in Portugal, available for bulk purchases. A vast variety of items, shapes, sizes, finishes and colours. Special shapes and colours can be created to the customer's specifications. Available with traditional ceramic glaze or cold-painted & varnished. All shapes are available in all colours and textures, glazed or varnished, matt or glossy. If you would like to receive catalogues, prices, samples, etc, please get in touch. Her intention is eventually to have a wider selection of products. She does not import or export in her own right ? the companies which she represents handle the despatch, payment and invoicing, leaving her free to focus on looking after your requirements. 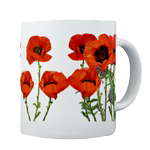 Also, as a long-term photography enthusiast, I have a massive collection of photographs of flowers (roses, poppies, daffodils, lilies, wildflowers, lots of long-stemmed flowers with white background, etc), fruit, vegetables and animals (including meerkats), suitable for printing as ceramic decals, some already available as ceramic designs for mugwraps, alphabets, etc. Many are also highly suitable as images for greeting cards. A few examples can be seen on this page, and on: photos. 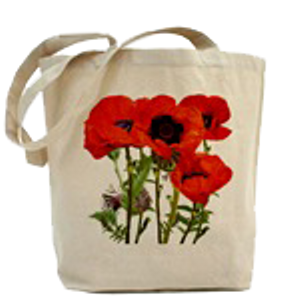 You can also see my poppy designs on T-shirts, clocks, mugs, mouse mats, buttons, greeting cards, various giftware items, etc on Cafepress Eileen's Poppies.